VANCOUVER, BC – Electric Bicycle Brewing has announced the release of a new beer inspired by a classic sitcom scene. 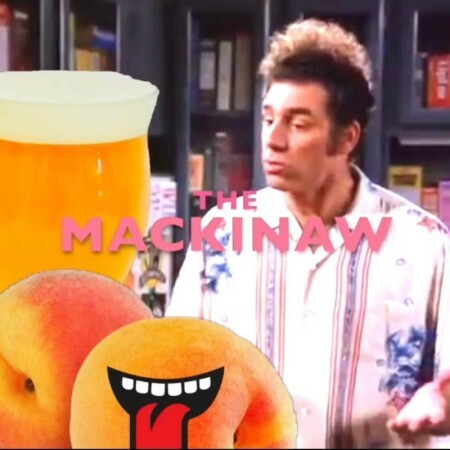 The Mackinaw Hazy Peach Rested IPA makes your taste buds come alive. To the naked eye, up close and personal, this beer has a stunning Pale Amber colour. On the nose this beer presents a beautiful aroma of ripe peaches and other stone fruits. When you take a sip of the Mackinaw it’s like having a circus in your mouth, the mouthfeel is creamy and has notes of honey and peach pie while still remaining sharp and crisp on the palate from the late addition of citra and mosaic hops. The Mackinaw is refreshing while still warming your cheeks on a brisk autumn day, it is a true miracle of nature, like the Aurora Borealis!! “JUST TAKE A TASTE”!! The Mackinaw is available now on tap and for growler fills at Electric Bicycle.